Fertilizers and other agri-chemicals must be properly maintained and safely stored to ensure personnel protection. Store bulk fertilizer inventory in a compliant fertilizer storage building to remain safe and compliant. Be sure to contact the Environmental Protection Agency and/or your Department of Agriculture to understand all compliance regulations are followed when storing fertilizers and agri-chemicals. While this document provides a number of compliant fertilizer and chemical storage guidelines, it does not address every regulation for maintaining fertilizer storage compliantly. Fertilizer storage can vary by state, therefore contacting your state’s Department of Agriculture about fertilizer and/or chemical storage is advised. Assess your fertilizer and chemical storage inventory by using the guidelines below. Implement labels and signs on your fertilizer storage building’s external structure to identify hazardous chemicals being stored. A secondary containment sump must contain at least 10% of the total stored liquid volume, or 100% of the largest container of stored liquid volume. Store light-duty storage on the bottom rack of your fertilizer storage building. Secure your fertilizer storage building with a locking system. Mix, dispense, and handle fertilizer away from surface water bodies. Do not store fertilizers with livestock or near animal feed. Always store fertilizers in their original containers. Place your fertilizer storage building on a level-ground, away from areas that may cause flooding. Store fertilizer storage out of direct sunlight or other ignition sources including heaters, or equipment. Do not stack fertilizer storage. Take inventory of fertilizer storage before it is placed in storage. Mark containers with the date of purchase so a FIFO system can be used. Mechanical and natural ventilation may be necessary (depending on geographical location and the type of fertilizer being stored). There are two different types of fertilizer spills: dry spills and liquid spills. It is very important to have a spill prevention and control plan in place before storing fertilizer inventory. Contact the EPA to learn more about spill response and prevention. Dry Spills: Contain dry spills by sweeping fertilizer and reusing the fertilizer as it was intended. Dry impregnated fertilizer is considered a pesticides, therefore if spilled, it should be swept up and applied as intended. Liquid Spills: Large spills can be dangerous and can contaminate waterways and groundwater. Contact local authorities if the spill is out of your control. If a fertilizer spill occurs inside your fertilizer storage building do not pump the fertilizer away. Liquid fertilizer can be reused if they are not contaminated. Have an emergency response plan for your site and have contact information for local authorities on-hand. EPA compliant leak-proof secondary spill containment. 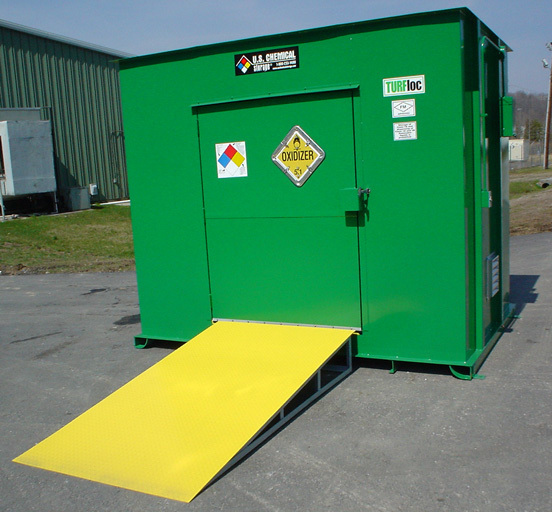 Removable steel floor grating for access to spill containment. Meets EPA, OSHA, NFPA regulations. FM or Warnock Hersey approvals. Static grounding system and seismic bolt-down plates.